More than 40 years ago, the world’s first space station—Salyut 1, a “salute” to Yuri Gagarin, the first man in space —was launched into orbit by the Soviet Union. 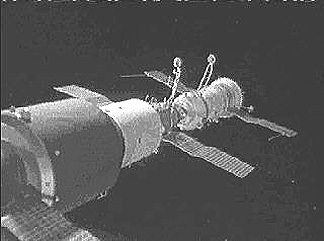 In April 1971, it was visited by Soyuz 10, but a fault with the docking prevented the three cosmonauts from entering the station. Following corrective actions, the Soviets planned to fly two further missions to Salyut 1, the first of which (Soyuz 11) would be commanded by the world’s first spacewalker, Alexei Leonov. However, an unfortunate series of incidents would conspire to frustrate Leonov’s mission … and brought tragedy to the men who flew in his place. – Below, launch of the Salyut 1 space station atop a Proton rocket. Photo of Salyut 1 with docked Soyuz 10 spacecraft, taken from TsKBEM photographer satellite. – Credits: TsKBEM. The original plan after the Soyuz 10 failure was to fly Leonov and his Soyuz 11 crew, Valeri Kubasov and Pyotr Kolodin, on 4 June 1971, followed by another crew, consisting of Georgi Dobrovolski, Vladislav Volkov, and Viktor Patsayev, aboard Soyuz 12 on 18 July. Both missions would spend between a month and six weeks aboard Salyut 1, although it remained unclear if consumables aboard the station could support both teams until August. The Soviets decided that the length of Dobrovolski’s flight would therefore be dependent upon the success of Leonov’s mission. Then, on 3 June, shortly before Soyuz 11 was due to fly, all these plans fell apart. It was a devastating judgement, coming so soon ahead of launch. Leonov and Kolodin were furious and argued their case, but to no avail. Chief Designer Vasili Mishin told them that they may have drunk from the same cup as Kubasov and might also be affected, whilst the cosmonauts’ commander, Nikolai Kamanin, added to Leonov that arguing about it was not “reacting in the correct manner” to a decision which had already been made. Kolodin, it is said, returned to the hotel at Baikonur and got himself heavily drunk on vodka, crying with rage and frustration at his lost chance to fly into space. 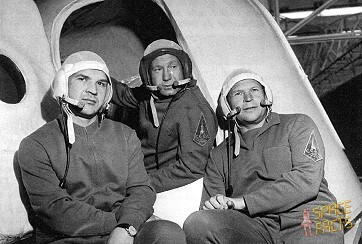 The original Soyuz 11—from the left, Valeri Kubasov, Alexei Leonov, and Pyotr Kolodin—were grounded shortly before launch by an unfortunate medical misdiagnosis. – Credits: Roscosmos. For the replacement crew of Dobrovolski, Volkov, and Patsayev, it was not a moment of euphoria, for they had been training barely four months … and would be required to fly into space in a matter of days. Only Volkov had flown before, and he had no docking experience. A strong sense of foreboding permeated Baikonur in those final days. “If you look at photographs of the replacement crew, just before the launch,” Leonov wrote, “they even look a little scared.” Late on the evening of 3 June, before the doctors’ decision had been made, Leonov did a pencil sketch of Patsayev and later named it Patsayev’s Eyes, because the civilian engineer looked distinctly troubled. At some point that evening, he even approached Leonov to apologize for taking his place on the mission. 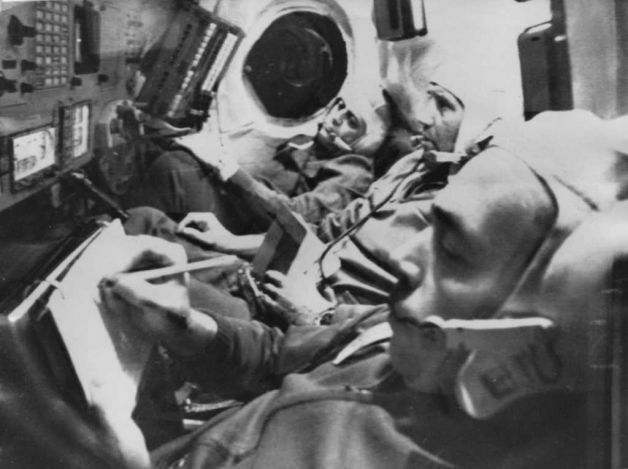 Rare image of Vladislav Volkov (left) and Georgi Dobrovolski aboard Salyut 1. – Credits: Roscosmos. The sense of foreboding seemed to have disappeared by launch morning, and Dobrovolski, Volkov, and Patsayev smiled and waved their caps at the crowds before boarding the elevator at the pad. At 7:55 a.m. Moscow Time, they lifted off and arrived, without incident, at Salyut 1 the next day, 7 June. When the first television images of the three cosmonauts inside the station were displayed in the control center, the room erupted in applause. A stay of around three weeks, producing a landing on 30 June, was now likely. In those three weeks, the cosmonauts performed scientific experiments, exercised, took medical data, performed astronomical observations … and, on the 16th, endured a small fire aboard Salyut 1. It was Volkov who noticed it first: an odor of smoke coming from the aft end of the space station. The Soviets’ insistence upon ridiculous secrecy meant that he had to employ a code word over the radio—“Aboard the station,” he said, cryptically, “is the curtain”—with curtain being the code for fire or smoke. Ironically, the ground controllers had forgotten what curtain meant and asked Volkov to repeat what he had said … to which the excitable cosmonaut blurted out, “There is a fire on board!” Although it later became clear that the “dense black smoke” had come from an overheating instrument, and was soon brought under control, it underlined the seriousness and risk of fire aboard a space station. In the days that followed, the records rolled in, as the cosmonauts spent longer in orbit than anyone before them. On 18 June, Patsayev became the first spacefarer to celebrate a birthday in orbit. Little did he realize that his 38th birthday would actually be his last. Another picture of the Soyuz 11 crew during onboard the Salyut 1 space station. – Credits: Roscosmos. On the evening of the 29th, the three men departed Salyut 1 for the final time and took their places in the Soyuz 11 descent module for their return to Earth. Dobrovolski closed the hatch and sealed it by means of a rotating grip. However, he was surprised, and then alarmed, to notice that the “hatch-open” indicator on his panel remained lit. This told him that the hatch was not hermetically sealed, posing the risk of a pressure leak during re-entry and—since none of them had been provided with space suits—the death of the crew. It was fellow cosmonaut Alexei Yeliseyev’s calm voice from the Yevpatoria control center in the Crimea which solved the problem. He talked Dobrovolski and Volkov through the procedure: reopen the hatch and turn the grip fully to the left, swipe the hatchway with a tissue to ensure that no foreign debris had blocked it, then close the hatch and turn the grip several times to the right. The two men tried this several times, but to no avail; the indicator remained illuminated. Further troubleshooting eventually isolated the cause of the fault. “As the hatch closes,” Yeliseyev recalled later, “it pushes the sensors and they produce signals. All the sensors were in working order, but the guys found that the hatch hardly touched one of the buttons, with the result that it did not push down sufficiently to send the signal.” After visually checking that the hatch was, in fact, closing tightly and correctly, Dobrovolski was told to stick a bit of insulation tape over the sensor to “generate the signal artificially.” When the crew tried again, the indicator blinked off, much to the relief of all concerned. 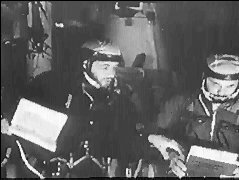 Minutes later, at 9:25 p.m. Moscow Time, the separation commands were initiated and Soyuz 11 successfully undocked from the station. When one considers the nightmare that was to follow in the next few hours, it is remarkable that no further sense of tension was noticeable in the cosmonauts’ words. As far as Dobrovolski’s crew was aware, a perfectly nominal return to Earth lay ahead of them. A long, challenging, and successful space mission was finally coming to an end, and they would soon be able to see and touch and speak to their loved ones again. The strain was gone from Volkov’s voice, as he joyfully announced the undocking and the stunning view of the world’s first space station drifting away into the inky blackness. They would be the last humans ever to see Salyut 1 up close. 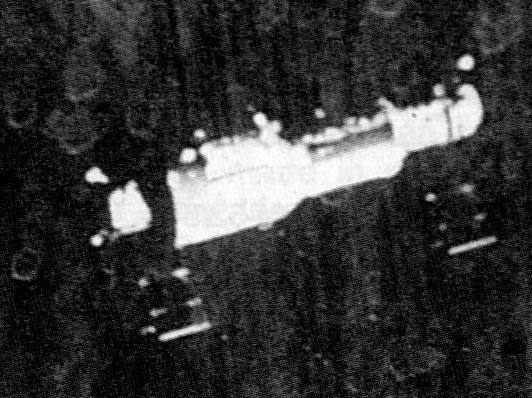 Grainy image from the departing Soyuz 11 mission in June 1971, showing Salyut 1. This was one of the last close-up views of the world’s first space station. Credits: Roscosmos. Nor did anyone aboard the tracking ships Bezhitsa or Kegostrov, positioned off the coast of Africa and in the South Atlantic. It would appear that a breakdown of communications and a change of plans to perform the retrofire on the third, not the second, orbit after undocking effectively meant that Soyuz 11’s position at the point of retrofire was out of range of both tracking vessels. Nine minutes after the completion of the retrofire burn, at 1:47 a.m., the circumstances that would precipitate disaster began to unfold. As the spacecraft passed high above central France, a dozen explosive charges jettisoned the orbital module and six others set the instrument module adrift, as planned. The bell-shaped descent module was now on its own, continuing on its trajectory towards a touchdown on Soviet soil, a couple of hundred kilometres east of the city of Jezkazgan. In the control center at Yevpatoria, everyone was still very much in the dark … and concerns were rising. No one knew if the retrofire had been completed and, even if it had not, there should have been some form of communication from the crew. Both Kamanin and Soyuz 10 veteran Vladimir Shatalov tried repeatedly to call the cosmonauts over VHF radio, but to no avail. An awful, yawning silence pervaded the airwaves. Soyuz 11 continued to plummet Earthward, passing over eastern Germany and Poland and finally entering Soviet territorial airspace at 1:54 a.m. Radar installations had actually detected the incoming descent module a few minutes earlier as it passed to the north of the Black Sea, but, since it was sheathed with super-heated plasma, it had been temporarily out of radio contact. The Yevpatoria controllers, upon hearing this news, were somewhat encouraged and speculated that perhaps a radio failure was to blame for the cosmonauts failing to respond to their calls. – A dramatic reenactment of the last moments of life of the Soyuz 11 crew by filmmaker Vaughn Juares. The next few minutes, though, would bring Russia and its proud space program to their knees in pain and despair. – By Ben Evans. This article was originally published in AmericaSpace. It is republished with permission of the author and editor. Be sure to check out Mr. Evans’ sequel to this story, The Crew That Never Flew: The Misfortunes of Soyuz 11. It is so awful when someone dies in space, nobody to help you, and very little to do to help yourself.